Welp. It's that time of the year again. Time to break out the grilling foods and let the party begin. My belly has already been growling at the delicious aromas of the neighbor's cookout foods, and it always puts a frown on Jason's face since he's not invited. Since I switched to a vegetarian diet, he doesn't get grilled foods often unless it's veggie based, so summertime is a bit hard for him with all of that grilled goodness filling the air. Now, I'm going to tell you a little secret. Vegetarian food does not have to be bad. Actually, it can be pretty damn good if you know what you're doing in the kitchen. Thankfully for him, this girl does know a thing or two about how to give food an extra boost of oomph. Grilling season used to be hard for me too. I'd have to slave over our grill making burgers for friends and family, then sit back and watch them enjoy the deliciousness that I could no longer have. But, now that I'm a vegetarian of 2 years, I've learned how to concoct a veggie burger that will rival its meaty counterpart any day of the week. Even Jason will agree, my veggie burgers are killer. 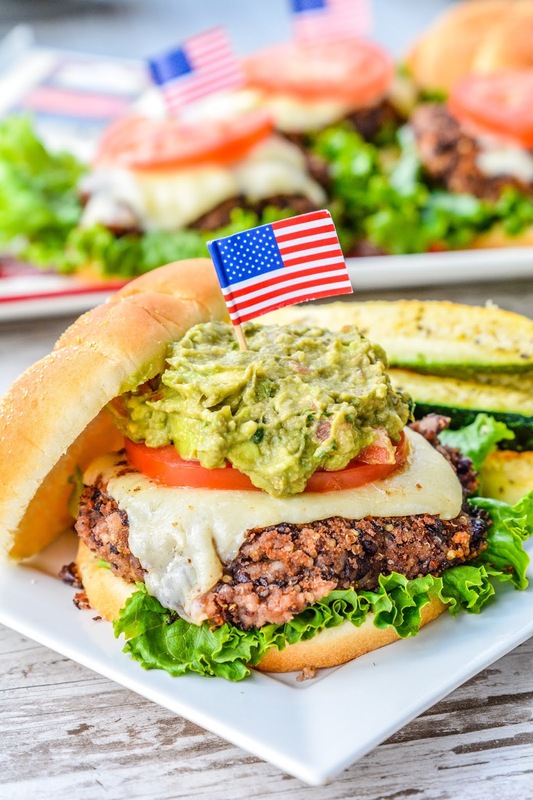 Made with a mix of quinoa and a hearty helping of black beans, these burgers are healthy and filling. But, you can't have a burger without cheese, am I right? Yes, I am. I really love using specialty cheeses in my recipes because they are usually aged to perfection and have a bolder flavor over the brands you find in the grocer's refrigerated section. 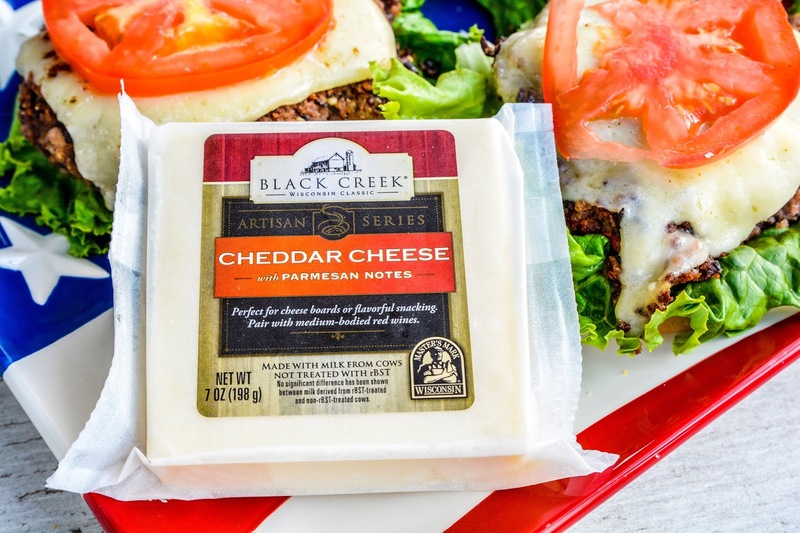 One of my favorites, Black Creek® Cheddar, can be found in the deli section at your local grocers. 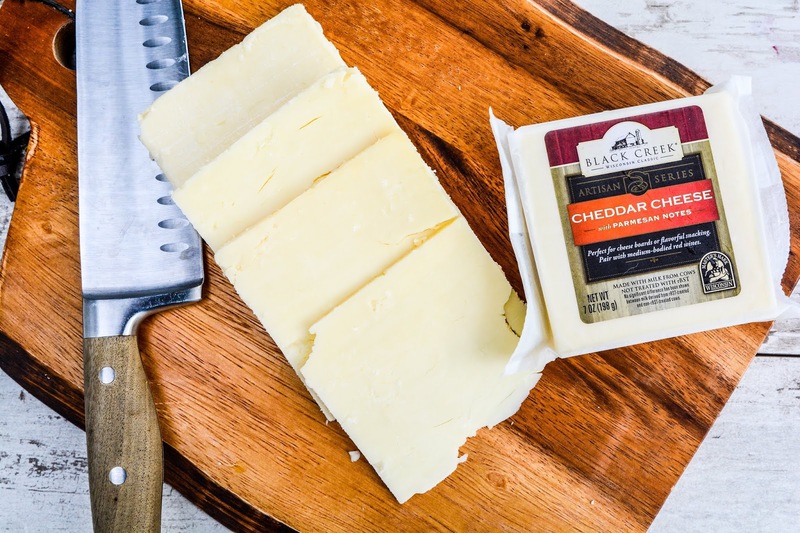 Black Creek® Premium Cheddar is made in Wisconsin's Fox River Valley, where the soil is rich and the pasture is picturesque. The region's cows graze on nutrient-rich grasses producing distinctly rich and creamy milk. That milk is then conscientiously cultivated into smooth, full-flavor cheddar under the eye of a Certified Master Cheesemaker. 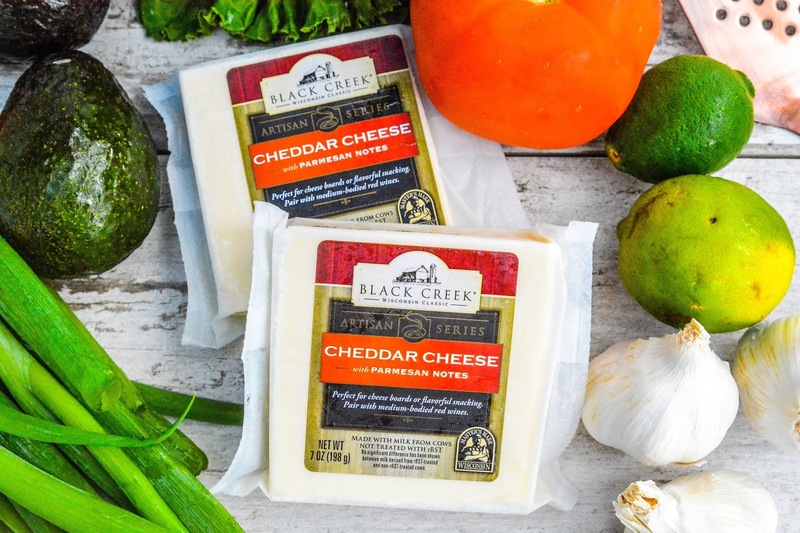 Black Creek® Cheddar is aged up to 3 years, which in turn offers a pleasantly sharp and complex flavor profile which is both rich and nutty. 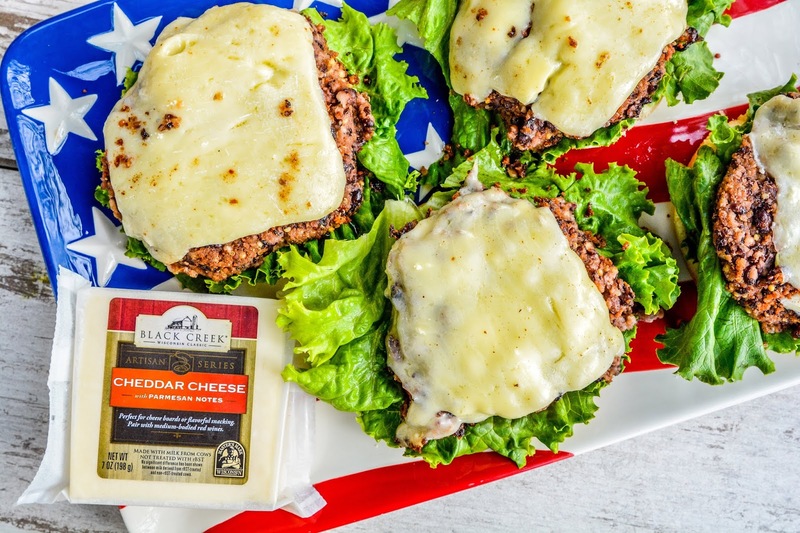 For Memorial Day this year, I will be making my all time favorite Southwest Veggie Burgers topped with Black Creek® Cheese and a yummy guac topping. In a small pan, bring the quinoa and water to a boil. Reduce heat, cover, let simmer about 15 minutes, or until water has been absorbed and quinoa is tender. Using a fork, mash the black beans into a rough consistency. Leave a few whole beans in tact. You want a nice texture, not a pile of mush. Mix in the Panko, red pepper, parsley, onion powder, cumin, chili powder, garlic, salt, black pepper, and quinoa into the black bean mixture. *Sometimes it's just best to get in there and use your hands for this task* Stir in the egg. Form the black beans into patties. You can get 4 to 6 patties from this mixture, depending on how big you form them. Heat the oil over medium-high heat in a skillet. Cook the patties in the hot oil until heated through and a hard crust has formed on the the patty surfaces, about 5 to 6 minutes per side. Cut your Black Creek® Cheese block into slices. Place a slice on each patty and let melt. Make the guac topping while the patties are frying: Mix the avocado, tomato, onion powder, and lime juice until you've reached a creamy consistency. Top your burgers with a tomato slice and guac topping. Serve immediately. 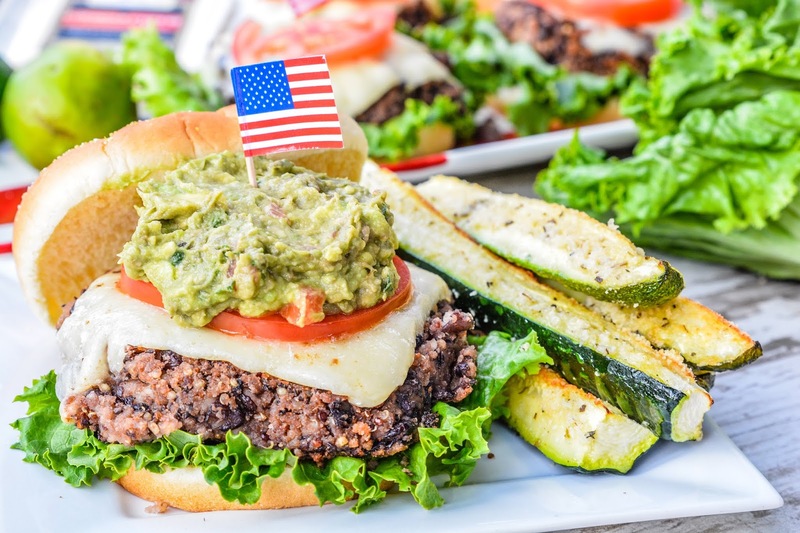 Serve these burgers up with a side of zucchini fries and you'll have one amazing meal that will even make your meat eating neighbors wish they got an invite to your Memorial Day shindig. 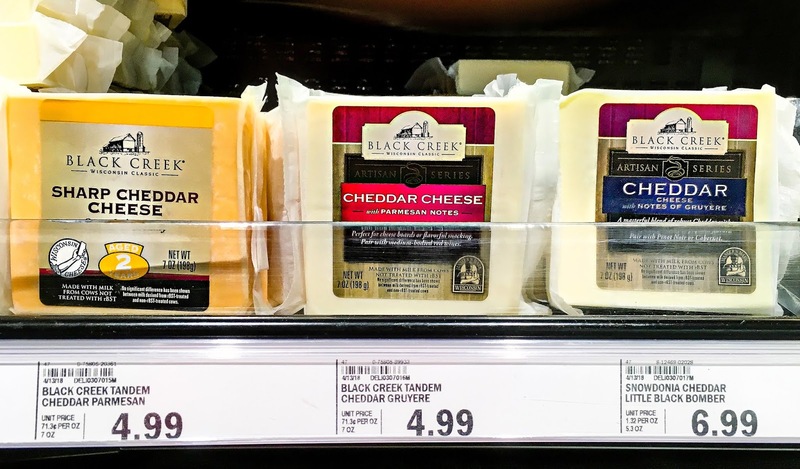 Be sure to look for Black Creek® Cheddar Cheeses in the deli section of your grocers. Remember, summer is better when you just add cheddar! 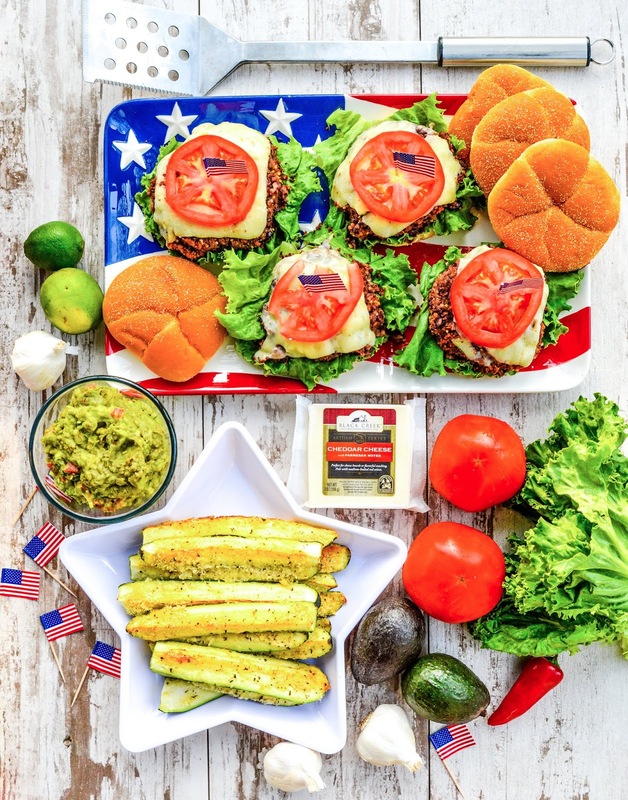 What's on your Memorial Day menu this year? Looks legitimately nom, especially the grilled zucchinis! I ate them today in rice and Imma gonna eat them tomorrow as well in garlic pure :) I've never had grilled veggies in my life, though. We have fake veggie hard cheese here, but it is nasty. Zucchini is my fave. I could eat it all day and never get tired of it. I actually bought a veggie spiralizer this week to make myself some zucchini noodles. They were nom nom too! it doesn't melt because it's toxic and nasty :( They make it from vegetable proteins and I can only imagine what it goes through before being turned into cheese... :( When I really have a hunger for pizza and need cheese I rather buy a piece of real Trappist or Gauda cheese. Do you make patties with zucchini? I sometimes used that patty mixture to stuff filo pastry too for savoury rolls. And also for savoury muffins. The flag is a nice touch on top. Sure sounds like veggies will do and you can grill away indeed. Thanks Pat. I do love to toss some veggies on the grill in the summer and get them nice and toasty. We are not celebrating. I'm just thrilled that it's going to be a day off of work, hahaha The burgers look fantastic! Love the side of zucchini fries too. Your title really says it all. Bring on the cheddar! I gotta have my cheese. We put cheddar cheese on almost everything when we grill. Burgers, dogs, chicken breast, porkchops - they all get the cheese treatment. That burger does look amazing and our family is all vegetarian so this would be perfect. I would love the toppings of cheese and guacomole as much as the burger. Everything is better with cheddar. It's not a cookout without cheese! Your food looks summer ready! I don't have any plans that I'm aware of yet. This burger looks so good! That looks amazing...and you're right, cheese is everything. I'll have to investigate this brand. Oh my, those are some amazing looking burgers!!!! I need to find this cheese! Everything is better with cheddar. I am hoping to have a BBQ this summer and invite tons of friends and family over. We will see. You totally had me at veggie burgers. What a great way to celebrate Memorial Day - with good food and good company! This looks SO good! I love cheddar so I'm definitely checking this out. A burger isn't complete without the cheese and this looks absolutely perfect! I've never tried the brand but I can see why they'd make summer so much better!